One of the things that Mark and I have in common is that we played the violin all through school. Mark actually started Suzuki violin with a Cracker Jack box when he was 3 years old. I started in 4th grade like everyone else in my school. H has always loved music. 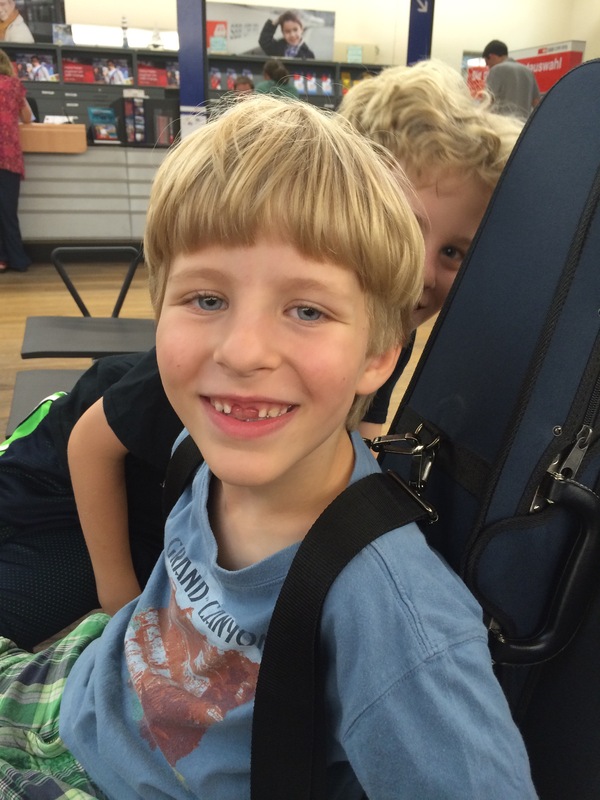 He likes to pick up E’s guitar and strum on it and we’ve signed him up for different music fun-camp experiences and some ill-fated piano lessons (it turns out that if he doesn’t like the teacher he’s not going to do anything they ask). And he’s constantly singing and making up songs around the house. 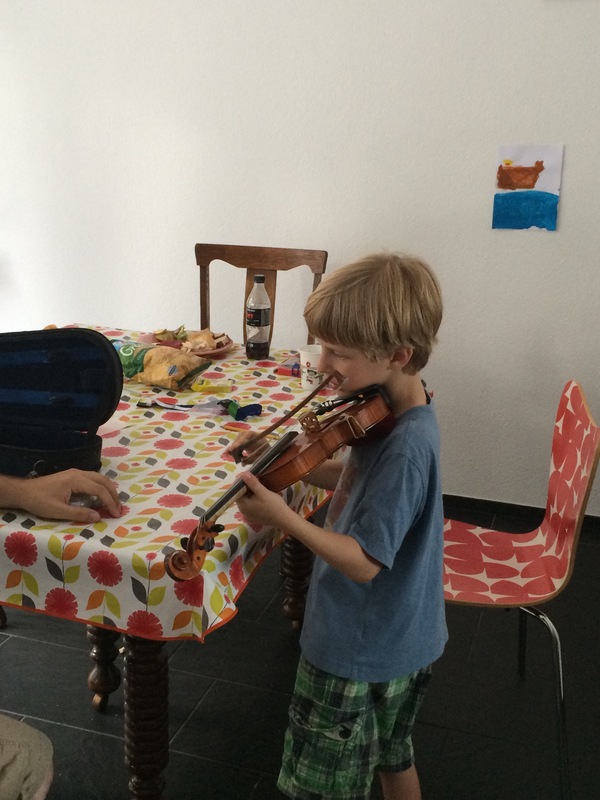 The violin genes go deep. Mark’s brother Erik is a professional violinist. We (including the boys) have seen him perform quite a few times. H loves to go to concerts and he’s been fairly certain that he wants to play the violin. About a month ago we went to my neighbor Barbara’s son’s cello concert. There were also violins at this concert as well. H was mesmerized by the string music. A while later Barbara and I were having coffee and I was telling her all about how H wanted to play the violin. She told me about this really fantastic violin shop right in Barfusserplatz in Basel. It’s where they rent their cello and there are tons of violins of all sizes to choose from. I managed to find it and drag Uncle Erik and Aunt Ellie there so I would have some guidance. Yes, Mark and I both played violin for 40 years combined, but when you have professionals in the house you take advantage of that. And I wouldn’t have to go alone with two extremely excited children. It was practically hidden just beyond the doors of a chocolate shop and up to the second floor of an old building in Barfusserplatz. The shop was a 4 room flat. Every room had rows of violins hanging 3 or 4 deep all over the walls. Cellos were lined around the floor and a bass was leaning in the corner. 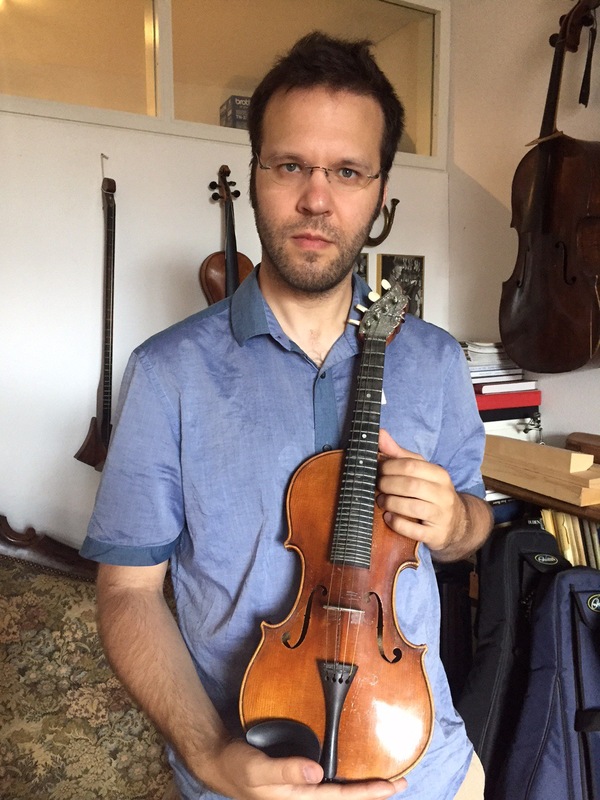 The violin maker, Herr Senn, greeted us at the door. He is a very tall man of about 60 with sparse curly white hair and twinkling blue eyes. He was wearing a work apron over a blue t-shirt and tan shorts. When we told him we needed a violin for the 6 year old he took us into the next room to an elegant narrow oval table surrounded by string instruments. He gestured to a pair of scroll carved Renaissance dinner chairs and matching bench covered in an rich avocado green and gold velvet brocade. With practiced ease he tossed a matching green velvet cloth over the table and laid out several tiny violins. H was bouncing and could barely contain himself. Herr Senn came over and put the tiniest red velvet shoulder rest on the violin and gave it to H. Satisfied with the size he then put a bow into H’s anxiously waiting fingers. It was beautiful. Not screechy. No dying cats. Just a lovely pure sound. H was beyond delighted. And then I asked about a violin for me! SQUEEEEE! He pulled out two violins and I set about trying to make sound. It was so intimidated to try to play again after having not touched a violin for almost 10 years. I wasn’t bad, but I was concentrating too hard on trying to make notes and not on comparing the sound so I handed it over to Erik. Taking Erik’s opinion under consideration, I selected my violin and Herr Senn took me to his cashier’s station/work bench to fill out the contract. The work bench was covered with violin bits and the display case underneath had scads of mutes, tuner pegs, and other string instrument pieces I couldn’t name neatly tucked into organizers. While we were signing documents and Aunt Ellie watched H and E ooo and ahh over his new violin, Uncle Erik was perusing the display of unusual violins along the wall. A violin with a head like a guitar and metal frets caught his eye and he hesitantly asked about it. It turns out it was made at the request of a sitar player! And he let Erik play it! We were all delighted with the slightly nontraditional violin sound. And then he got to play the violin with 1 string and carved horn! That was completely odd! We asked where he got that one and he pointed right out the window to the flea market going on across the street. He found it there several years ago while taking a break from the shop. He also showed us a travel practice violin that was only a violin frame held together with small metal hinges. It folded down to a loaf about 8 inches long by 4 inches wide! 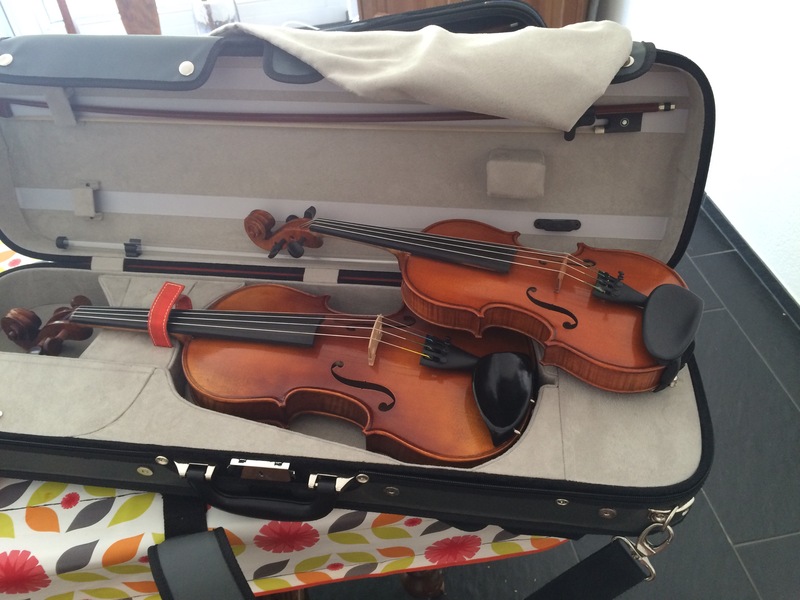 Finally, after two years of begging we rented H a violin. He is absolutely OVER THE MOON. H slung the violin onto his back and walked with jaunty steps, humming to himself. When we got home he asked Uncle Erik for a lesson and the two of them working together is one of the cutest things ever. He also took his violin to his room that and slept with it next to his bed. And he’s continued to do so ever since. I’ve been playing as well and I will perhaps admit to having played at least 6 times. Perhaps even as many as 9. I just love it. I was so nervous that my fingers wouldn’t remember where to go and what to do, but they seem to be figuring it out. My scales, that I used to practice for about 30 minutes a day, are a bit dodgy, but the pieces I am playing are actually sounding like music! 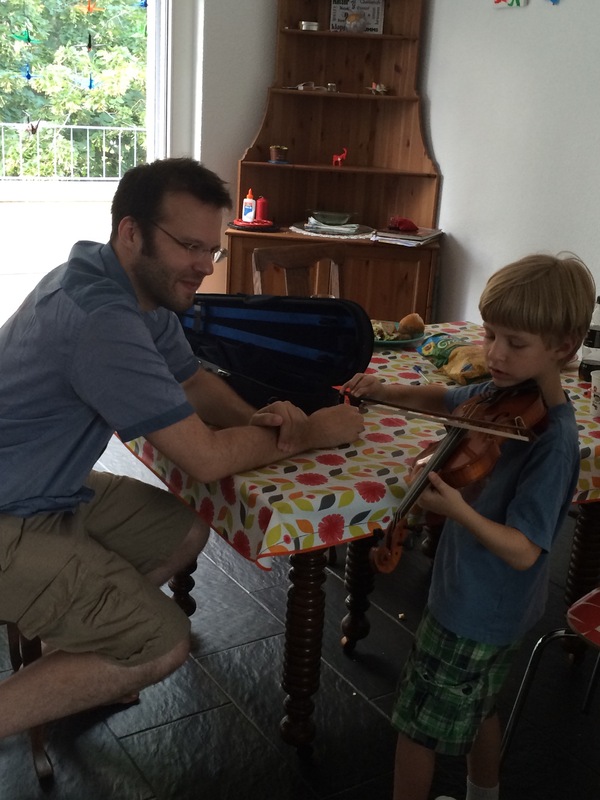 Even Mark has picked up the violin and is finding that his fingers are remembering as well. Perhaps we’ll need to have a second violin for him and we can play duets! There’s even a glimmer of interest in the violin from E. We’ll see what happens! Now to find H a teacher. Calls have been made. Emails have been sent. Fingers crossed. This is proper technique, right?